Reader Ahmé last wrote to us with details about the under-seat spaces she and Thomas (her Miniature Schnauzer, traveling in a large SturdiBag) encountered on a couple of different Delta flights. She kindly wrote again last fall, after she and Thomas had visited a pet relief area at Lambert-St. Louis International Airport. As you can see, it’s fairly small, and the grass is tired. Ahmé noted that it’s right next to “a large area of beautiful grass” — all the more appealing as at least five previous pet owners had failed to pick up after their dogs (despite “great signage about cleaning up after your dog, a really nice garbage can and plastic bags provided”). “Why would I not just use that?” she asked, and I don’t have a good answer for her. Do pick up after your pup, wherever you end up letting her go — not that Dog Jaunt readers would ever be anything other than courteous. Speaking of courtesy, thanks so much to Ahmé for sharing her photo! If any of you visit the other STL pet relief area, outside Terminal 1, please send me a photo and let me know how challenging it is to find. 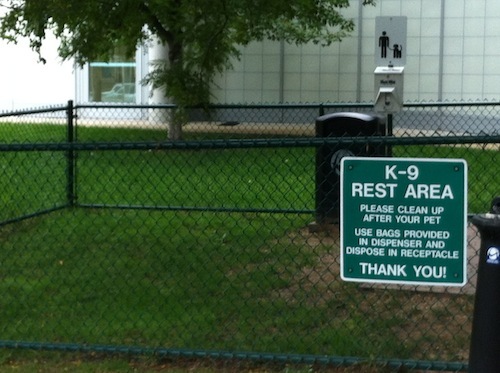 I’m adding this post to Dog Jaunt’s ongoing series of reviews of airport pet relief areas. To see others, visit Dog Jaunt’s handy guide to airport pet relief areas. A first time dog traveler and I visited the dog relief area outside Terminal 1, outside of the upper level ticketing area, exit 6. We were on an arriving flight and my mom was meeting us. She scoped it out ahead of time, so she was able to usher us straight there. She said it was very easy to find. I wish I’d snapped a picture- it looks a lot like the one in terminal 2 posted here, except it has synthetic grass- so it’s grassy all year round. It was well lit, close to the door and felt very safe (we visited at about midnight, so that was an important consideration). It got a thumbs up from me, especially after visiting the San Francisco airport’s dog relief area which involved quite the trek to find. Thank you, Beth!! I’m late in reviewing your comment, but still so grateful for it!